DOWNLOAD MAD SKILLS MOTOCROSS 2 NOW! Find out what 18 MILLION players already know: Mad Skills Motocross 2 is one of the best racing games ever made for mobile devices! Download it for FREE now! Mad Skills Motocross 2 features the best motorcycle physics of any side-scrolling racing game on the planet. You'll be amazed at the responsiveness of the bikes in this game. The more you play, the faster (and more addicted) you'll get. Work your way up through 9 different motorcycles, each with different speeds and handling. Get the fastest bike and dominate your friends! 72 TRACKS - WITH MORE ADDED EVERY WEEK FOR FREE! Mad Skills Motocross 2 has enough content to keep you busy for years. Beat the stock opponent on dozens of career tracks, and then see if you can beat the Ace to unlock more tracks. Once you've Aced them all, take on your friends, neighbors, and players all over the world. Mad Skills Motocross 2 features an online competition called JAM, which pits you against fellow players across the world on new tracks every week. JAM will likely be one of the most addicting experiences you've ever had on your mobile device. There are so many ways to compete against friends, people from your state/region, from your country, etc. Our VERSUS mode allows you to send and receive time-based challenges to friends and random opponents alike. Connect to Facebook or Twitter to race against your friends' best times on every Career track, to watch replays of their times, and to fight your way up the leaderboards. There are also leaderboards for your country, and in some markets, for your state/province/region. Social racing has never been so fun. Change the color of your bike and your rider's gear, and add your favorite number to your bike's number plate. If you're fast enough, you can even earn a virtual Red Bull helmet to let your friends know you rule! Work your way up our VERSUS levels to unlock more virtual rewards, including new gear, bike parts, and more. 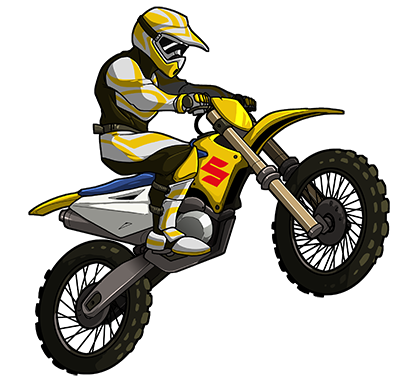 There is no limit on free gameplay in Mad Skills Motocross 2. You will never run out of gas. You'll never have to wait 10 more minutes in order to be able to race again. Race as much as you want, for free, forever. Optional rockets to help you past difficult levels and competitors.